For its first fifteen or twenty minutes, Target Earth plays like an episode of The Twilight Zone as two people wander around a deserted city wondering why everyone has left. Unfortunately, for its remaining hour or so, Target Earth plays like a really bad, low budget sci-fi movie called Target Earth. Purportedly the tale of a deadly invasion by a mysterious army and the efforts of a scrappy bad of survivors to outwit their indestructible enemies, Target Earth is really about one thing: guts. The guts the filmmakers displayed by pushing their clunky, box-like robot front and center as a terrifying force of vaporizing destruction even though every time it appears, the audience involuntarily wonders how many takes it took for it to walk up the stairs without the stuntman inside falling down. Really though, it’s completely cheap and gratuitous to claim this movie stunk once the robot started wobbling around the deserted city streets. 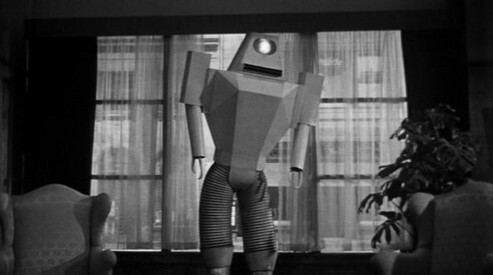 The movie really stunk long before that, just about the time when the four people left in the city cowered as they observed the shadow of the clunky robot on a building. If you can’t even use a shadow to disguise the fact that your robot is made up of some sheet metal and has all the agility of quadriplegic in a tarpit, you might as well just settle on having the world taken over by an “unseen menace” and let your audience do the work you were too cheap to do. But let’s say you’re an easy mark for these types of films and are willing to cut it some slack despite the fact that you’ve seen vacuum cleaners and snow blowers scarier than these invading robots. Sure, these robots are lumbering metal boxes with dryer hoses for legs, but when hundreds of them are marching en masse down Main Street, U.S.A. you can’t help but be chilled to the bone! After all, they’re just like metal zombies! I agree! The movie that has robot armies slowly and methodically plodding about and zapping any humans dumb enough to stand around gawking is going to get my endorsement no questions asked! When it comes down to it, sheer numbers will do you in every time. 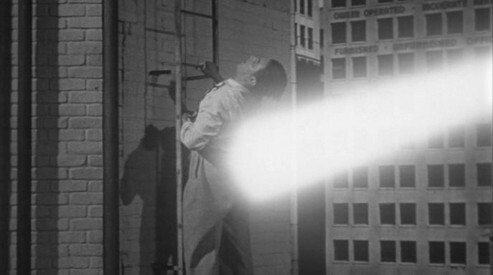 It’s too bad then that Target Earth‘s deadly robot invasion consisted of one robot. 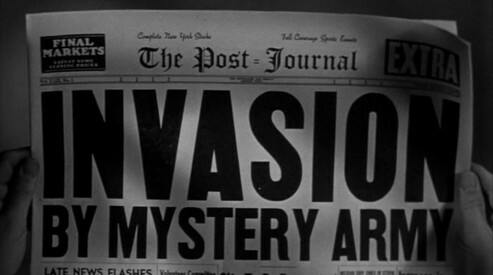 Oh sure, the military guys talked about armies of these invaders wiping out legions of soldiers, but what did we see? One robot shuffling after four people in a hotel. I had to think that when the humans were falling down trying run up the stairs away from the robot, they were falling down laughing. Of course, if we care about our heroes enough, we might be able to overlook a threat to them that is somewhat lacking. Of course Target Earth features a whiny suicidal broad, a shrew, a hot tempered guy prone to fighting with the shrew, and a guy with over-Brylcremed blonde hair who backhands Suicide Gal when she gets too spazy. There’s also the pointless addition of a crazed killer later on because when you’re battling a deadly robot invasion, a crazed killer harassing the survivors makes perfect dramatic sense. The guy with the blonde hair (Richard Denning, who would take on the end of the world again the next year in Roger Corman’s Day the World Ended) is presumably the brains of the operation. We know this because after getting a gander at the killer robot he declares that it’s probably from Venus. He knows this because a buddy of his was really into sci-fi magazines and he read a few of his buddy’s magazines and some of those writers were dead on with their predictions! 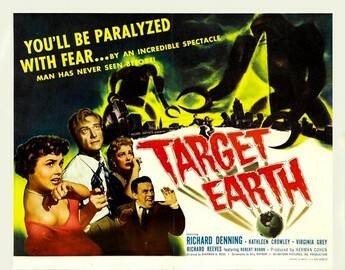 Target Earth is only required viewing for Whit Bissell fans who want to see him play a good guy scientist instead of the evil guy scientists he immortalized in teen monster epics like I Was A Teenage Werewolf and I Was A Teenage Frankenstein.